New Jersey election law guarantees voters’ right to see the campaign finances of political candidates before an election. In a state where government corruption is rampant, election law requires political candidates to disclose campaign finances. 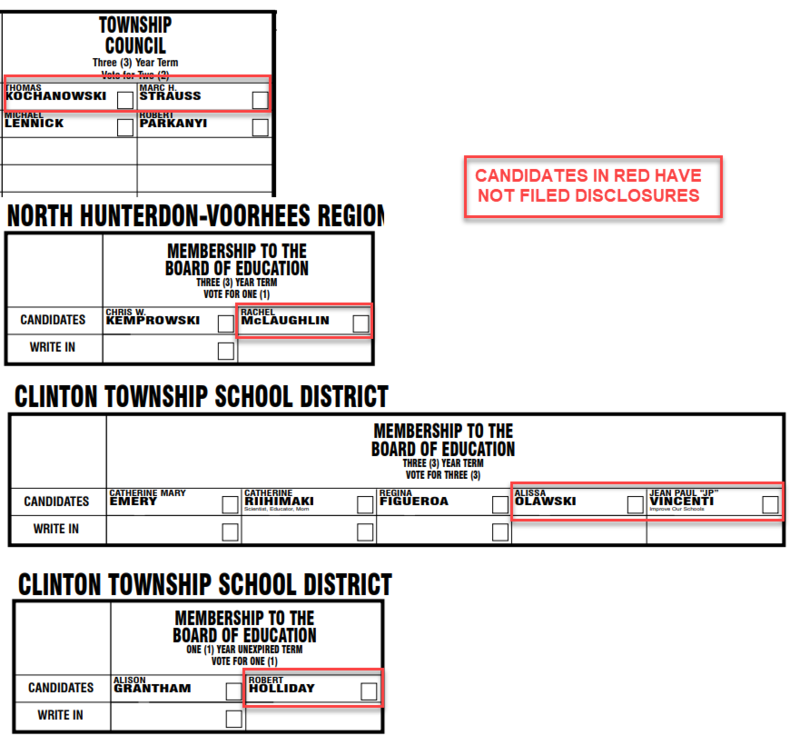 6 political candidates running for office in Clinton Township — out of 13 on the 2018 Clinton Township General Election Ballot — appear to be in violation of New Jersey Election Law. 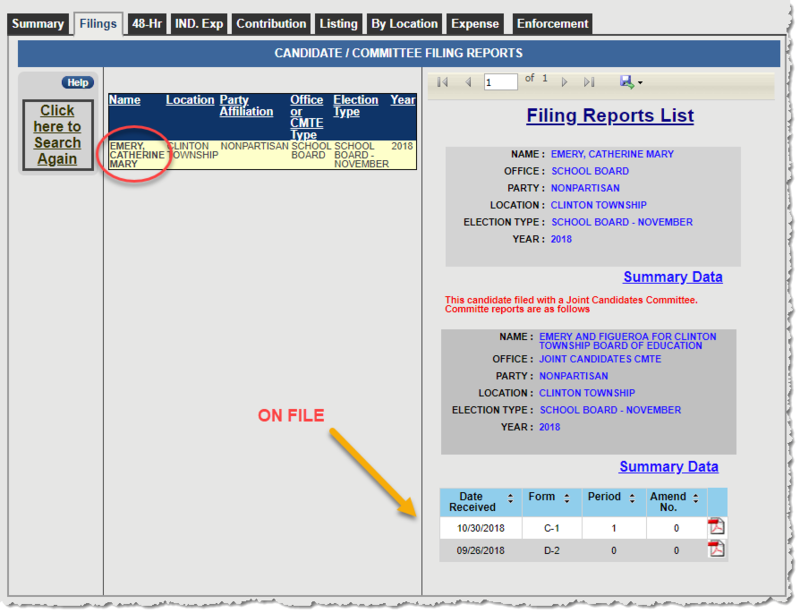 According to New Jersey’s public campaign database, they have not filed the required financial disclosures. See also: Clinton Township: Who’s worth voting for? If they don’t bother to follow the law before they get elected, what are they going to do about “upholding the law” after they get elected to run our town and our schools? 4 of the political candidates who seem to be ignoring the law are incumbents — already in office, already managing over $113 million of public funds. Clinton Township has a budget of about $13 million. Clinton Township School District has a budget of about $30 million. North Hunterdon-Voorhees School District has a budget of about $60 million. Voters are electing people to manage over $113 million of tax dollars. Do you hope they will bother to follow the law once they’re elected, if they’re not bothering to follow the law to get elected? Which candidates seem to be in violation of New Jersey Election Law? All appear to be in violation of New Jersey Election Law Enforcement Commission (ELEC) requirements to file financial disclosures for the benefit of voters under the New Jersey Campaign Contributions and Expenditures Reporting Act. Established in 1973‚ ELEC monitors the campaign financing of all elections in the State. All political candidates who raise or spend money on their campaigns — even their own money — are required to report their finances to the public. 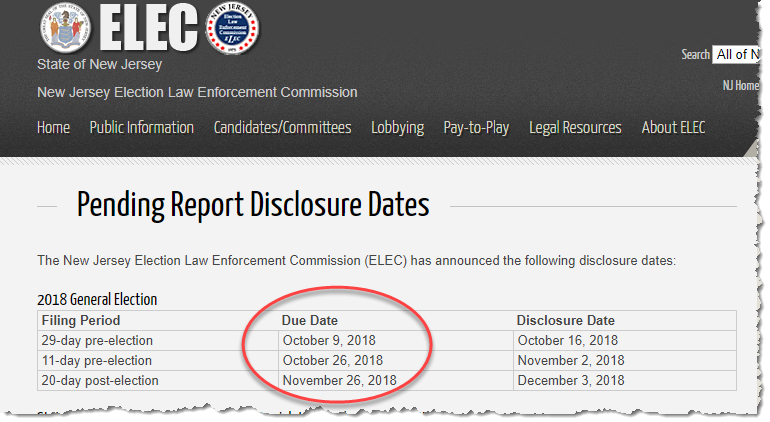 ELEC publishes candidates’ financial disclosures — and also shows which candidates have not filed the required disclosures. 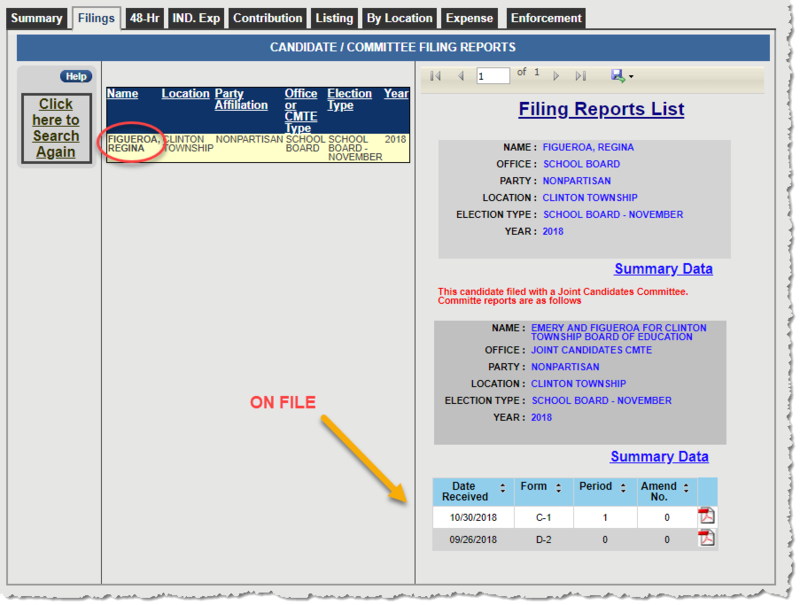 The following images — showing candidates failed to file required financial disclosures — were captured on November 1, 2018 from the public ELEC database. 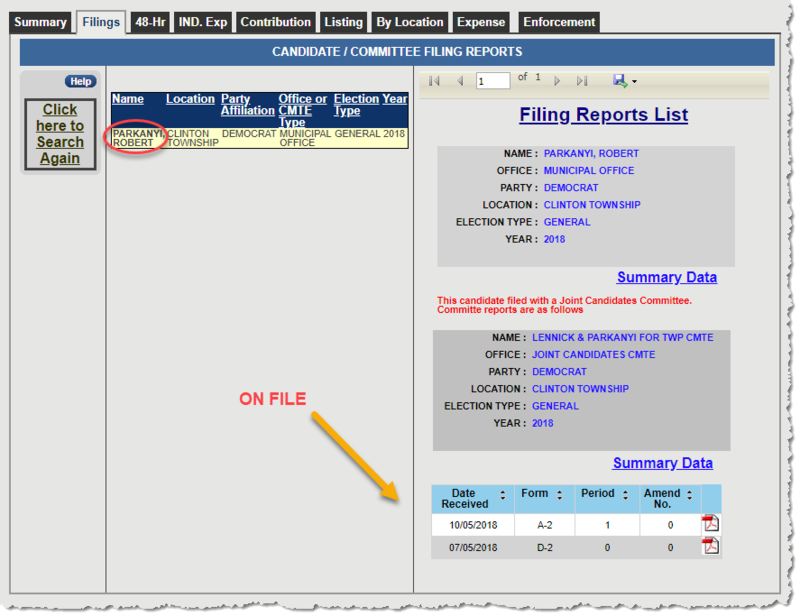 The following images — showing candidates filed required financial disclosures — were captured on November 1, 2018 from the public ELEC database. NOTE: North Hunterdon-Voorhees School Board candidate Chris W. Kemprowski appears not to have raised or spent any funds on campaign signs or other campaign materials and thus appears to be exempt from disclosure requirements. Keep political candidates honest. Expect them to follow the law before they get elected. 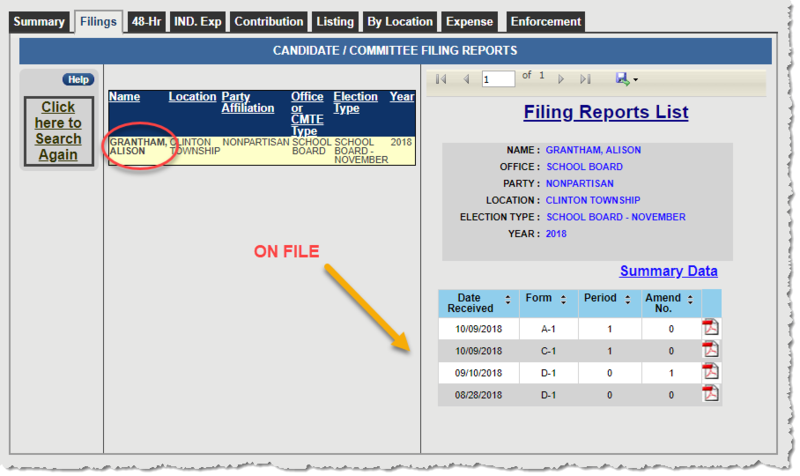 For more details about how candidates fail to obey New Jersey Election Laws, see Clinton Township: Who’s worth voting for? Do your homework before you cast your ballot. This entry was posted in Election and tagged ELEC, election. Bookmark the permalink.